Haredi council determines whether Defense Ministry's proposed draft law is acceptable compromise or requires haredim to leave coalition. The haredi "Council of Torah Sages" will meet on Thursday in Jerusalem to decide whether or not the draft law proposed by Israel's Defense Ministry is acceptable, requires changes, or should be rejected outright. 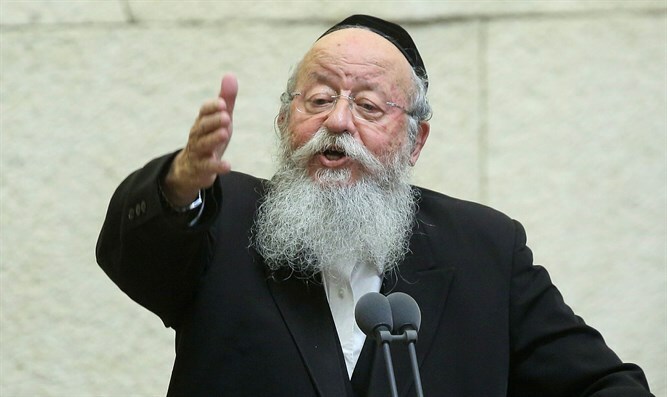 If the haredi parties reject the bill or cannot come to an agreement with the Defense Ministry regarding changes, the haredi parties may well choose to bolt the coalition, forcing new elections. The Council is connected to the the Ashkenazic-haredi UTJ party's hasidic faction. On Tuesday, UTJ MK Menachem Moses slammed the law for requiring sanctions against haredi draft-dodgers. "I thought this committee was professional, not political," he said. "I was disappointed to discover political fingerprints in their conclusions. But if it's political anyways, why were members of the UTJ and Shas, who are the 'guilty' ones, not invited to voice our opinions? And on the other hand, the ones who were invited were Mr. [MK Yair] Lapid (Yesh Atid) and [MK] Elazar Stern (Yesh Atid). They, specifically, were invited to voice their opinions. We were not invited - and this is a Defense Ministry committee, which claims to be professional." "Regarding the sanctions, which state that if we do not meet the enlistment quota, budgets to yeshivas will be cut: This doesn't come from a source of light. As mentioned, those who begin criminal and economic sanctions for this were specifically Lapid's party, Yesh Atid. They are the ones who placed full sanctions for failure to meet the quotas. "This thing, which sanctions educational institutions, is only mentioned with regards to haredi educational institutions. Would anyone think of sanctioning institutions of higher education in which pacifists, Nakba celebrators, Holocaust deniers, and all sorts of other bad things study? No one would even think of it."